as we traveled through the Canal. 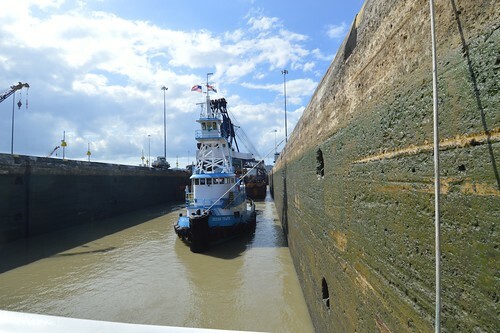 Our trip through the Panama Canal was beautiful. The first night of our trip -- March 1 -- we went through the first set of locks, on the Caribbean (or north) side of the isthmus. Our ship, the Lindblad-National Geographic Sea Lion, was towed by tractor-like "mules" that were designed and built for the canal originally during the construction process, that is around 100 years ago. We spent the night and the next morning in Gatun Lake, the large artificial lake on the Chagras River. The huge rains of the surrounding rainforest fill the lake and provide the water needed to work all the locks. After a tour of Barra Colorado Island in Gatun Lake, we proceeded through the Culebra Cut, the major engineering achievement of the original designers of the canal. A modern bridge spans this deep canal, just before the Pacific locks, which step the boat back down to the level of the Pacific Ocean. By dusk, we were sailing around Panama City and towards the Pearl Islands in the Gulf of Panama for our next day's activities. The entire Flickr set is here: Panama Canal 2014. How magnificent. I've always thought it would be fascinating to do this trip.